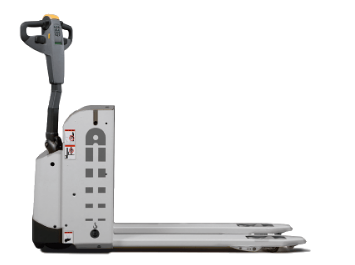 The Piccolo PLL is ideal for shop-floor replenishing, occasional order picking and short-distance pallet transportation. It is great for warehouses, supermarkets and production areas. The Piccolo is dependable, has long service intervals and is built to minimize servicing and maintenance, all to keep life cycle costs to a minimum. Climbing wheels in the forks come as standard, allowing the PLL pallet jack to work in almost any condition – from ambient temperatures to cold store environments down to –35°C. The narrow Piccolo handles slopes and ramps with ease and can handle tight turning radiuses. The optional Tiller-Up drive with the tiller arm in the upright position allows the Piccolo PLL to work in even tighter areas. Other features: Atlet Modular Concept design for highest First Time Fix Rate. AC motor for reduced maintenance plus maximum acceleration and drive speed. Four-wheel design for maximal stability. Patented 4-point Friction Force chassis for improved stability and traction. ATC truck computer with PIN code access for onboard diagnostics, optimum performance settings and preventing unauthorized use.